Thank you for your undivided attention to the Number 1 newsletter on Wall Street. After racking more then 40% Gains already this early in the week, it is time to make even More Gains. With Lithium stocks going crazy once again, a new innovation in the rechargeable battery space has the science world just as abuzz as Wall Street: the shift to the endless possibilities of Zinc. Zinc One Resources Inc. is a Vancouver-based company focused on the acquisition, exploration and development of prospective and advanced zinc projects in mining friendly jurisdictions. Zinc One's key assets are the past producing Bongará Mine Project and Charlotte Bongará Project in Peru. This company believes in the current and future fundamentals of the zinc supply and demand scenario and the continued growing demand for zinc in global industrial uses. They are currently reviewing multiple high quality zinc projects at various stages of development and will continue to seek out and evaluate properties that show promise for development. According to analysts, Zinc inventories have been declining for the last five years and there is a clear lack of supply in the market. The International Lead and Zinc Study Group released its initial 2017 report, which found the global market for refined zinc metal was in deficit over the first 11 months of last year with total reported inventories declining over the same time frame. That suggests a supply shortage is still in place that could propel Zinc prices solidly higher. With the added pressure from battery manufacturers, we could see a full-on shortage in Zinc. And that could mean prices for shares of a stock like ZZZOF could potentially blast through the roof! The real shock here is why on earth this stock has managed to stay under the radar of most investors even this long. But their oversight is your opportunity. As the company’s CEO recently noted, the stockpiles of zinc at the London Metal Exchange are down below 330,000 tons. Five years ago they were at 1.2 million tons. China hasn't stopped developing, they used to be an exporter of zinc, they're now an importer. All of this leads to our first key point: This is a stock in need of EXPOSURE! That’s why we are glad to see the company has recently started to invest in getting its story out there. This is huge opportunity. Shareholders can only benefit from more exposure. In addition, the company recently announced that its request to suspend the mine closure at the former Bongará Zinc-Oxide mine has been approved by the Peru Ministry of Energy and Mines. This is a critical step in order for Zinc One to commence production activity on the Bongará Zinc-Oxide Mine Project. That’s huge news for this stock. ZZZOF is an emerging leader in the booming Zinc market, where supply shortages are already showing up driven by new surging demand coming online from battery producers. ZZZOF recently completed a defining merger agreement and secured now up to 5 different properties in one of the most prolific zinc producing zones on the planet in Peru. ZZZOF also recently inked a deal to raise non-dilutive capital through sale of inessential asset, booking a value exceeding $600K that should flow to bottom-line results over time. 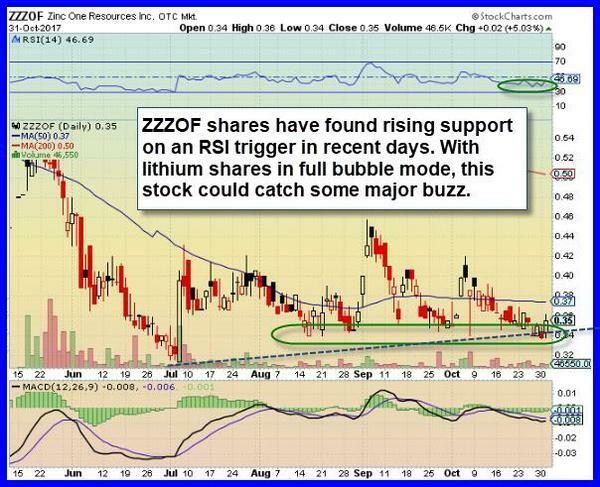 ZZZOF is coming off an RSI trough under 40, pointing to a massively oversold stock now heading back the other way. ZZZOF is one of the few pure plays on Zinc. Given recent surges in Cobalt and Lithium stocks, Zinc could be next. Right now, shares are oversold according to the RSI indicator, which is well under 50. The company’s share structure is simple and clean, with very few outstanding shares (73M) or stock options (3.6M), suggesting the overhead supply factor won’t get in the way if we see attention turn into excitement in this symbol. Support is in place, with a quadruple technical floor in place at potential $0.33-0.35 zone on the chart, suggesting that someone potentially is in there accumulating shares ahead of a possible run higher in this unique pure-play on the booming zinc market. This one could be simply Huge!